Minnesota Environmental Law Attorneys - Dudley and Smith P.A. Looking for experienced Minnesota Environmental Law Attorneys? Dudley and Smith, P.A. is a Minnesota based law firm offering a wide range of services including assistance with environmental law, compliance and environmental litigation where necessary. Whether you are an individual, a corporation, a property owner, or anyone else looking for Minnesota Environmental Law Attorneys we have the resources and the knowledge to walk you through the environmental law issues you are currently facing and work toward the best outcome possible. We serve clients across Minnesota and Wisconsin with aggressiveness, tenacity and personal attention that will make the difference to your business. When it comes to protecting your business and avoiding legal problems down the road, it is always best to consult with with a Minnesota environmental law attorney before signing on the dotted line. At Dudley and Smith, P.A. we work closely with each client to identify potential problems and eliminate environmental liability from the start. Eliminating legal risks before they happen is the best way to avoid a lawsuit and a large financial liability. If you are looking to build or if your business uses chemical substances, you may be in conflict with environmental law. The United States Environmental Protection Agency (EPA) lays out strict terms and regulations for permits, licensing and compliance that all businesses, property managers, builders and other corporations must adhere to. Having a Minnesota environmental attorney working side by side with your business can offer security and confidence that you are obeying the laws and avoiding potential legal disputes down the road. If you are facing an environmental legal dispute, however, we will work aggressively on your behalf to resolve the conflict. Whether the conflict can be resolved through mediation or whether you need to go to court, we will be there, representing you with diligence, honor and professionalism. Our environmental attorney can serve as both a general counsel and as a trial attorney. 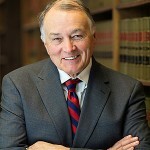 Joseph J. Dudley Jr. has over 30 years legal experience and specializes in environmental law. Mr. Dudley is highly knowledgeable in the field of environmental law and understands all aspects of EPA regulatory issues, zoning codes and environmental liability. If you are currently facing a legal environmental problem or want to reduce environmental liability on your business, contact Minnesota law firm Dudley and Smith, P.A. today at 651-291-1717.